Heat 2 tablespoons of oil in a medium, heavy skillet. Add the onion and green pepper. Sauté for about 5 minutes. Add the refried beans, parsley and tomatoes. Mix in with the onion and pepper. Sauté for five to seven minutes, stirring frequently. Remove from the heat and set aside. To prepare the guacamole, place all ingredients in a medium mixing bowl and mash with a potato masher or the back of a fork until it is a chunky paste. Set aside. Spread the bean mixture evenly over three of the tortillas. Place the remaining three tortillas on top forming a sandwich. Lightly brush some of the remaining oil in a heavy, medium skillet and heat up. Place one quesadilla in the skillet and cook until lightly brown, about 2 minutes or so. Flip over and brown the other side. 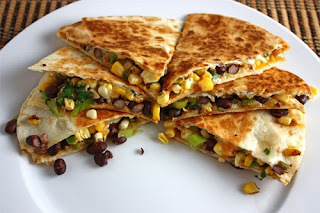 Remove from the skillet and repeat, adding more oil as needed, until all quesadillas have been browned. Slice the quesadillas into quarters. Serve each slice with a dollop of guacamole and a tablespoon or so of salsa. Serve as a main dish or as a party snack. Enjoy it and stay healthy Friends!